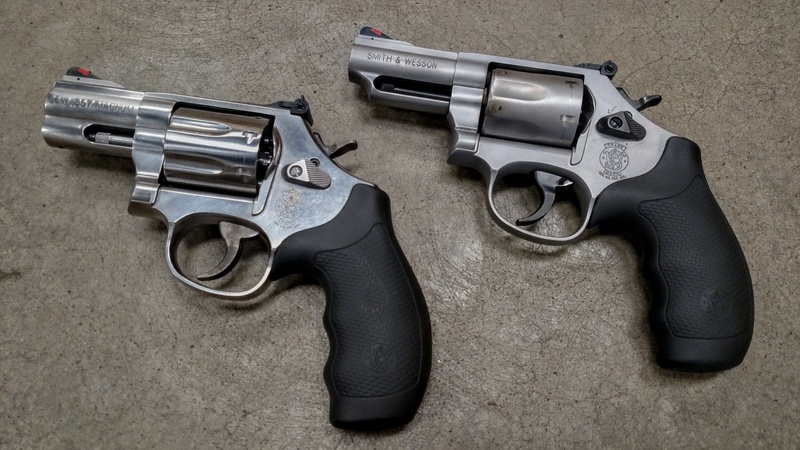 [su_dropcap style=”flat” size=”5″]B[/su_dropcap]ack in 1961, Colt allowed some announcements to leak out about a new target-sighted single action they’d soon release. At the time, I’d hoped for a return of the early ﬂat-top target model of their famous Single Action Army, but instead, they introduced the New Frontier model. And while that is an exceptionally ﬁne revolver, it really didn’t appeal to my oldtime, traditional tastes. Finally, a mere 55 years later, Dixie Gun Works has added the Uberti Cattleman Flat-top to their catalog, and it was worth the wait. 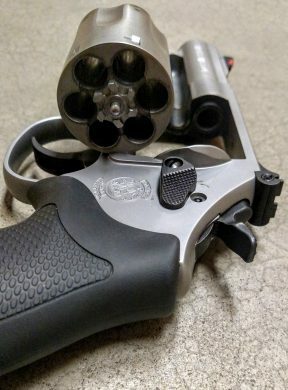 In addition to being historically correct, this is a six-gun built for accurate and ﬁne shooting. The details of that historical correctness begin with the cartridges this gun is chambered for. Currently (although things can change), the ﬂat-top Cattleman is offered only for the .45 Colt and the .44/40. 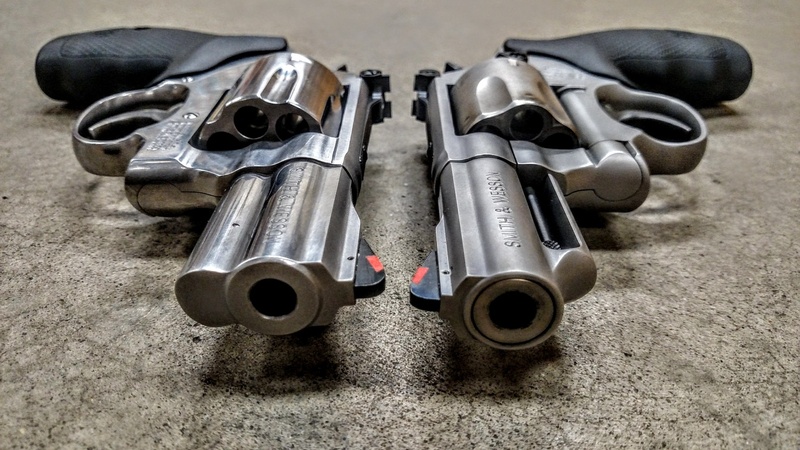 Of those two cartridges, the .45 is certainly the most common today, just as it was years ago. 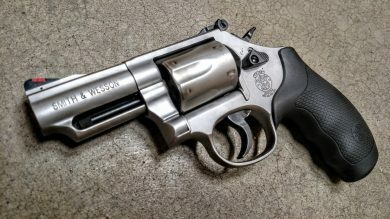 If all of my wishes had come true, this new gun would be offered in .44 Smith & Wesson Russian/Special too. 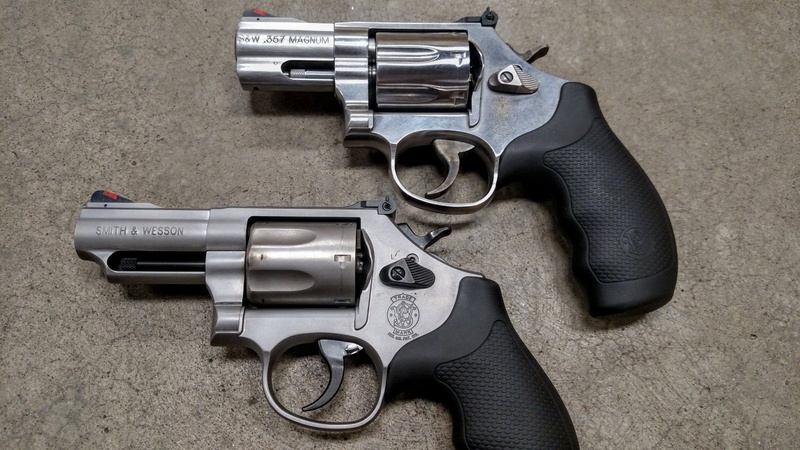 However, with the .45 Colt and the .44/40 to choose from, one of the .44/40s was my choice. The blue and color case hardening, combined with the excellent fit and finish, make this a beautiful gun. THE MOST OBVIOUS DIFFERENCE between this target model and the standard frame guns, in addition to the ﬂat-top frame, is the sights. At the back, the rear sight sits in a dovetail and it is easily windage adjustable, with a small set screw to lock it in place. The front sight is a blade pinned into a lug soldered to the top of the barrel. Originally, the front sight could be changed, and that should be possible on this gun too (simply drive out the pin), but a new front sight blade would have to be made. 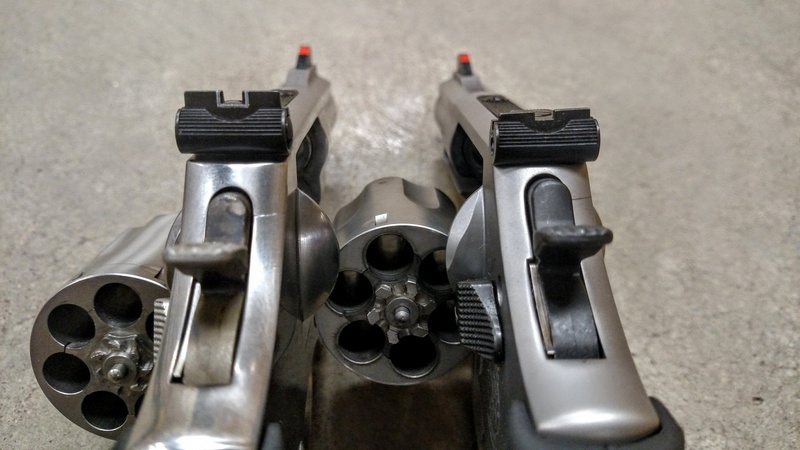 Another feature I really like is the wide trigger. 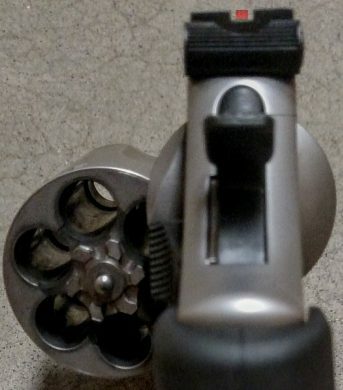 Instead of the standard narrow trigger found on most Colt Single Actions and their clones, this trigger is the same width as the trigger guard. That will give the trigger ﬁnger a much better “grip” while aiming for the shot. Interestingly enough, in reviewing some original ﬂattops, I discovered that not all of them had the wide triggers. Additionally, a few of the models with wide triggers had their triggers checkered. To me, that’s an interesting detail about the rare original Colts, and likewise for these rather uncommon copies. The “flat-top” is clearly seen in this image, along with the adjustable rear sight. a requirement. I will even admit that my best shooting was done with smokeless powdered loads. THOSE LOADS ARE GOOD ENOUGH to mention in detail. First, the bullets used for all of my loads were cast from Lyman’s mold #427098, usually out of a soft 30-1 alloy, sized to .429 inches, and lubricated with BPC lube (Black Powder Cartridge lube from Montana Armory). Primers used were always CCI’s standard Large Pistol. The black powder load used 33.0 grains of GOEX’s Olde Eynsford powder, which ﬁlls the Starline .44/40 cases almost to the top. Then the powder is compressed simply by seating the bullet down on it. For a smokeless powder load, all of the above remains the same except for the powder charge. Instead of using black powder, I used a charge of 7½ grains of Unique. That is basically a recommended load, not near maximum at all, and some very comfortable shooting can be done with it. That is an accurate load too, good enough for pleasing groups and controllable enough for Cowboy competition. This gun has the “black powder frame” with the base pin held in by a screw. To make load identiﬁcation very easy, I load my black powder ammo in Starline’s nickel-plated cases, while the smokeless load go into standard brass cases. Both of those loads seem to hit at about the same elevation. For my “accuracy check,” I posted a couple of pistol targets at 50 feet, and ﬁred the ﬂat-top from a rest. While holding the sights at 6 o’clock, right at the bottom of the black, very good hits were made, mostly in the 10 ring. The smokeless load did produce a somewhat smaller group than the black powder loads, but I only made this comparison once, and I’m certain a lot of “human element” was involved. 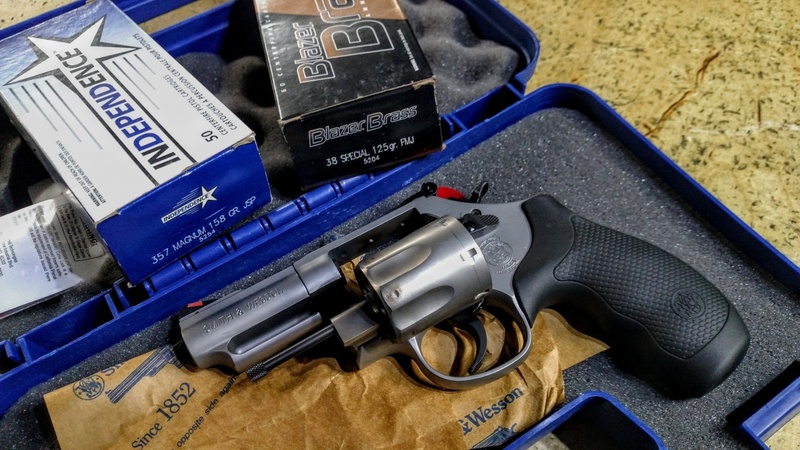 The trigger is as wide as the trigger guard, making this revolver very comfortable to shoot. WHAT WAS A LOT MORE FUN, as you could probably guess, was plinking with the black powder loads. One particular small target was teasing me, and that was a clothespin hanging on a wire at a distance of 25 or 30 yards. There was a good dirt bank backstop behind it, and I could spot exactly where my shots that missed actually hit. It took me only three tries to hit that clothespin, and it disassembled quite nicely on my third shot. AS FOR TECHNICAL INFO about the gun, the 7½-inch-long barrel is riﬂed with grooves .004 inch deep and a rate of twist at one turn in 20 inches. The groove diameter of the barrel is .429 inch. This gun’s front sight is a silver blade that is held with a screw in the blued steel base. The rear sight is a nice wide square notch that sits in a dovetail. It is windage adjustable and it has a set screw to hold it in place. This gun measures 13.25 inches overall, and it weighs about 2½ pounds. Dixie’s price, at this writing, is only $450.00, making this a lot of gun for the money. Shooting with the Flat-top Cattleman is, for me, a real pleasure. And now, if they’ll bring back the ﬂat-top Bisley Model, I hope my name is at the top of their list.